Lewis Robert Wilson (April 26, 1900 – November 23, 1948) was an American Major League Baseball player who played 12 seasons for the New York Giants, Chicago Cubs, Brooklyn Dodgers and Philadelphia Phillies. Despite his diminutive stature, he was one of the most accomplished power hitters in the game during the late 1920s and early 1930s. His 1930 season with the Cubs is widely considered one of the most memorable individual single-season hitting performances in baseball history. Highlights included 56 home runs, the National League record for 68 years; and 191 runs batted in, a mark yet to be surpassed. "For a brief span of a few years", wrote a sportswriter of the day, "this hammered down little strongman actually rivaled the mighty [Babe] Ruth." While Wilson's combativeness and excessive alcohol consumption made him one of the most colorful sports personalities of his era, his drinking and fighting undoubtedly contributed to a premature end to his athletic career and, ultimately, his premature demise. He was inducted into the Baseball Hall of Fame in 1979. Lewis Robert Wilson was born April 26, 1900, in the Pennsylvania steel mill town of Ellwood City, north of Pittsburgh. His mother, Jennie Kaughn, 16, was an unemployed drifter from Philadelphia; his father, Robert Wilson, 24, was a steel worker. His parents never married; both were heavy drinkers, and in 1907 his mother died of appendicitis at the age of 24. In 1916 Lewis left school to take a job at a locomotive factory, swinging a sledge hammer for four dollars a week. Although only five feet six inches tall, he weighed 195 pounds with an 18-inch neck, and feet that fit into size-five-and-one-half shoes. Sportswriter Shirley Povich later observed that he was "built along the lines of a beer keg, and was not wholly unfamiliar with its contents." While his unusual physique was considered an oddity at the time, his large head, tiny feet, short legs and broad, flat face are now recognized as hallmarks of the Fetal Alcohol Syndrome. In 1921 Wilson moved to Martinsburg, West Virginia, to join the Martinsburg Mountaineers of the Class "D" Blue Ridge League. After breaking his leg while sliding into home plate during his first professional game, he was moved from the catcher's position to the outfield. In 1922 he met Virginia Riddleburger, a 34-year-old office clerk; they married the following year. In 1923, playing for the "B" division Portsmouth Truckers, he led the Virginia League in hitting with a .388 batting average. Late in the season, New York Giants manager John McGraw purchased his contract from Portsmouth for $10,500. Wilson made his major league debut with the Giants on September 29, 1923 and became the starting left fielder the following season. By mid-July he was ranked second in the National League (NL) in hitting. He ended the season with a .295 average, 10 home runs, and 57 runs batted in (RBIs) as New York won the NL pennant. In the 1924 World Series he averaged only .233 in a seven-game loss to the Washington Senators. Multiple stories exist to explain the origin of Wilson's nickname: By one account, a New York newspaper held a nicknaming contest; the winning entry was "Hack" because he reminded many fans of another stocky athlete, the popular wrestler Georg Hackenschmidt. In another version, McGraw is said to have remarked that Wilson's physique was reminiscent of a "hack" (slang for taxicab in that era). Giants teammate Bill Cunningham claimed that the nickname was based on Wilson's resemblance to Hack Miller, an outfielder with the Chicago Cubs. The New York Times printed the first documented usage of "Hack" on June 10, 1924. Early in the 1925 season Wilson hit the longest home run on record at Ebbets Field against the Brooklyn Robins, but fell into a slump in May, and was replaced in left field by Irish Meusel. On July 2 he hit two home runs in one inning, tying Ken Williams' major league record set in 1922, but his hitting slump continued. In August McGraw told reporters that he had "...made the mistake of rushing [Wilson] along," and sent him to the Giants' minor league affiliate, the Toledo Mud Hens of the American Association. At season's end, a front office oversight—or possibly, deliberate inaction—left him unprotected on the Toledo roster, and the last-place Chicago Cubs acquired him on waivers. "They let go the best outfielder I ever played alongside", said Giants right fielder Ross Youngs, "and they're going to regret it." During the 1925 World Series — between the Senators and the Pittsburgh Pirates — Wilson's son, Robert, was born. Wilson regained his form as the Cubs' center fielder in 1926, and he quickly became a favorite of Chicago fans. On May 24 he hit the center field scoreboard with one of the longest home runs in Wrigley Field history as the Cubs came from behind to defeat the Boston Braves. Later that evening he made news again when he was arrested during a police raid of a Prohibition-era speakeasy while trying to escape through the rear window, and was fined one dollar. He ended the season with a league-leading 21 home runs along with 36 doubles, 109 RBIs, a .321 batting average, and a .406 on-base percentage. The Cubs improved to fourth place, and Wilson ended the year ranked fifth in voting for the NL's Most Valuable Player (MVP) Award. Another strong performance followed in 1927 as Wilson once again led the league in home runs. Although the Cubs were in first place heading into the final month of the season, the team faltered and again finished fourth. Wilson posted a .318 average with 30 home runs and 129 RBIs, and led NL outfielders with 400 putouts. He led the NL in home runs for a third consecutive year in 1928 with 31, along with 120 RBIs and a .313 average as the Cubs improved to third place. Wilson had a combative streak and sometimes initiated fights with opposing players and fans. On June 22, 1928, a near-riot broke out in the ninth inning at Wrigley Field against the St. Louis Cardinals when Wilson jumped into the box seats to attack a heckling fan. An estimated 5,000 spectators swarmed the field before police could separate the combatants and restore order. The fan sued Wilson for $20,000, but a jury ruled in his favor. The following year he took offense at a remark by Cincinnati Reds pitcher Ray Kolp, and – upon reaching first base after hitting a single – he charged into the Reds dugout, punching Kolp several times before they could be separated. Later that evening at the train station, Wilson exchanged words and blows with Cincinnati player Pete Donohue. In late 1929 he signed a contract to fight Art Shires of the Chicago White Sox in a boxing match, but reneged after Cubs president William Veeck, Sr. enlisted Hack's wife Virginia to dissuade him, and then Shires lost a fight to George Trafton of the Chicago Bears. There was nothing to gain, Wilson said, by fighting a defeated boxer. Wilson's "penchant for festivities" is also well documented. Biographer Clifton Blue Parker described him as "... the Roaring '20s epitome of a baseball player, primed for an age of American excess ... at a time when baseball was America's favorite sport." His love of drinking and partying did not endear him to Cubs owner William Wrigley, who abhorred alcohol consumption. (Wilson always insisted that he never played drunk; "hung over, yes; drunk, no.") Manager Joe McCarthy worked hard to shield Wilson from Wrigley, and to keep him on an even keel. "Better than any other manager", wrote sportswriter Frank Graham, "Joe understood Hack, made allowances for him when he failed, and rewarded him with praise when he did well. Joe could be strict and stern with his players ... but he never was with Hack, and Hack repaid him by playing as he never had before, nor would again." In 1929 Wilson hit .345 with 39 home runs and a league-record 159 RBIs. He and new teammate Rogers Hornsby (who also contributed 39 home runs) led the Cubs to their first NL pennant in eleven years. In the World Series against Connie Mack's Philadelphia Athletics, Wilson's .471 hitting performance was eclipsed by two fielding errors at Shibe Park. Though trailing the Series two games to one, the Cubs were leading by a score of 8–0 in the fourth game when the Athletics mounted a 10-run rally in the seventh inning. Wilson lost two fly balls in the sun; the second, with two runners on base, led to an inside-the-park home run by Mule Haas as the Athletics won 10–8. After the game, McCarthy reportedly told a boy asking for a souvenir baseball, "Come back tomorrow and stand behind Wilson, and you'll be able to pick up all the balls you want!" The Athletics won again the next day to take the Series in five games. 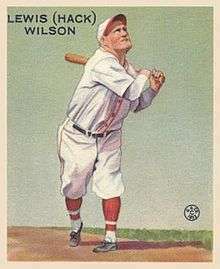 Wilson's 1930 season, aided by a lively ball wound with special Australian wool, is considered one of the best single-season hitting performances in baseball history. By the middle of July he had accumulated 82 RBIs. In August he hit 13 home runs and 53 RBIs, and by September 15 he had reached 176 RBIs, breaking Lou Gehrig's major league record established three years earlier. He ended the season with 190, along with an NL-record 56 home runs, .356 batting average, .454 on-base percentage, and league-leading .723 slugging percentage. He was unofficially voted the NL's most "useful" player by the Baseball Writers' Association of America (which did not inaugurate its official MVP award until 1931). Reds catcher Clyde Sukeforth asserted that Wilson should have been credited with an additional home run in 1930 as well. "He hit one in Cincinnati one day", he said, "way up in the seats, hit it so hard that it bounced right back onto the field. The umpire had a bad angle on it and ruled that it had hit the screen and bounced back. I was sitting in the Cincinnati bullpen, and of course, we weren't going to say anything. But Hack really hit 57 that year." Wilson's official total of 56 stood as the NL record until the 1998 season, when it was broken by Sammy Sosa (66) and Mark McGwire (70). Wilson's success in the 1930 season served only to fuel his drinking habits, and in 1931 he reported to spring training 20 pounds overweight. In addition, the NL responded to the prodigious offensive statistics of the previous year (the only season, other than 1894, in which the league as a whole batted over .300) by introducing a heavier ball with raised stitching to allow pitchers to gain a better grip and throw sharper curveballs. Wilson complained that the new Cubs manager, former teammate Rogers Hornsby, did not allow him to "swing away" as much as Joe McCarthy had. He hit his 200th career home run at Ebbets Field on June 18 — only the fourth player ever to do so, behind Ruth, Cy Williams, and Hornsby — but then fell into a protracted slump, and was benched in late May. By late August Wrigley publicly expressed his desire to trade him. On September 6 he was suspended without pay for the remainder of the season after a fight with reporters aboard a train in Cincinnati. He was hitting .261 with only 13 home runs (his 1930 production during August alone) at the time. In December 1931, the Cubs traded Wilson, along with Bud Teachout, to the St. Louis Cardinals for Burleigh Grimes. Less than a month later, the Cardinals sent him to the Brooklyn Dodgers for minor league outfielder Bob Parham and $25,000. Wilson hit .297 with 23 home runs and 123 RBIs for Brooklyn in 1932. He began 1933 with a ninth-inning game-winning pinch-hit inside-the-park grand slam home run at Ebbets Field—the first pinch-hit grand slam in Dodger history, and only the third inside-the-park pinch-hit grand slam in MLB history. By season's end his offensive totals had dropped substantially, and he was hitting .262 when the Dodgers released him mid-season in 1934. The Philadelphia Phillies signed him immediately, but after just two hits in 20 at bats he was released again a month later. After a final season with the Albany Senators of the Class "A" New York–Pennsylvania League, Wilson retired at the age of 35. In a 12-year major league career, Wilson played in 1,348 games and accumulated 1,461 hits in 4,760 at-bats for a .307 career batting average and a .395 on-base percentage. He hit 244 home runs and batted in 1,063 runs, led the NL in home runs four times, and surpassed 100 RBIs six times. Defensively, he finished his career with a .965 fielding percentage. 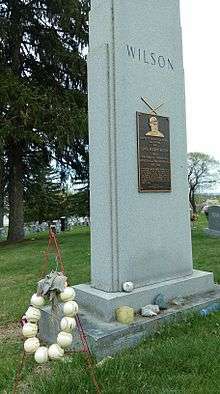 Hack Wilson's grave marker, located in Rosedale Cemetery in Martinsburg, West Virginia. Wilson returned to Martinsburg where he opened a pool hall, but encountered financial problems due to a failed sporting goods business venture, and then a rancorous divorce from Virginia. By 1938 he was working as a bartender near Brooklyn's Ebbets Field where he sang for drinks, but had to quit when customers became too abusive. A night club venture in suburban Chicago was another financial failure. In 1944 he took a job as a good will ambassador for a professional basketball team in Washington, D.C., where he lamented that fans remembered his two dropped fly balls in the 1929 World Series far more vividly than his 56 home runs and 191 RBIs in 1930. Unable to find work in professional baseball, he moved to Baltimore where he worked as a tool checker in an airplane manufacturing plant and later as a laborer for the City of Baltimore. When municipal authorities realized who he was, he was made the manager of a Baltimore public swimming pool. On October 4, 1948 Wilson was discovered unconscious after a fall in his home. Though the accident did not appear serious at first, pneumonia and other complications developed and he died of internal hemorrhaging on November 23, 1948, at the age of 48. Wilson — once the highest-paid player in the National League — died penniless; his son, Robert, refused to claim his remains. NL President Ford Frick finally sent money to cover his funeral expenses. His gray burial suit was donated by the undertaker. In marked contrast to Babe Ruth's funeral, which had been attended by thousands just three months earlier, only a few hundred people were present for Wilson's services. He was buried in Rosedale Cemetery in the town where he made his professional playing debut, Martinsburg, West Virginia. Ten months later Joe McCarthy organized a second, more complete memorial service, attended by Kiki Cuyler, Charlie Grimm, Nick Altrock and other players from the Cubs and the Martinsburg team (by then renamed the Blue Sox). A granite tombstone was unveiled, with the inscription, "One of Baseball's Immortals, Lewis R. (Hack) Wilson, Rests Here." "Talent isn't enough. You need common sense and good advice. If anyone tries to tell you different, tell them the story of Hack Wilson. ... Kids in and out of baseball who think because they have talent they have the world by the tail. It isn't so. Kids, don't be too big to accept advice. Don't let what happened to me happen to you." In 1979 Wilson was inducted into the Baseball Hall of Fame by the Veterans Committee. A Martinsburg street is named Hack Wilson Way in his honor, and the access road to a large city park within his home town, Ellwood City, Pennsylvania, is known as Hack Wilson Drive. 1 2 3 4 5 6 7 8 9 10 11 12 13 "Hack Wilson statistics". Baseball Reference. Retrieved February 21, 2011. 1 2 3 4 5 6 7 8 9 Holway, John (June 1996). Hack Wilson Belted Homers, Hecklers with Equal Gusto. Baseball Digest. Books.Google.com. Retrieved February 28, 2011. 1 2 Parker 2000, p. 195. 1 2 "Death Overtakes Hack Wilson Of Home Run Fame". The Evening Independent. Associated Press. November 24, 1948. p. 19. Retrieved March 1, 2011. ↑ Dolgan, Bob (March 1978). Former Teammates Recall Hack Wilson. Baseball Digest. Books.Google.com. Retrieved March 1, 2011. ↑ Drooz, Al (October 1974). ...But Memories of Hack Wilson Fade Away. Baseball Digest. Books.Google.com. Retrieved March 1, 2011. ↑ "Hack Wilson at The Baseball Hall of Fame". baseballhall.org. Retrieved February 28, 2011. ↑ Parker 2000, p. 7. ↑ Connery, Floyd (2003). Baseball's Most Wanted II: The Top 10 Book of More Bad Hops, Screwball Players, and Other Oddities. Washington, D.C.: Potomac Books. p. 58. ISBN 1-57488-362-3. Retrieved January 8, 2015. ↑ Parker 2000, p. 12. ↑ Collier, Gene. No One Stacks Up to Hack. Pittsburgh Post-Gazette archive Retrieved March 28, 2011. ↑ Wickersham's Conscience. Wordpress.com archive Retrieved March 28, 2011. 1 2 3 "Hack Wilson minor league statistics". Baseball Reference. Retrieved February 21, 2011. ↑ Parker 2000, p. 16. ↑ Parker 2000, pp. 16, 22. ↑ "1923 Virginia League Batting Leaders". Baseball Reference. Retrieved February 28, 2011. ↑ "Hack Wilson Cost The Giants Price Of A Bag Of Peanuts". Rochester Evening Journal. King Features Syndicate. September 11, 1924. p. 8. Retrieved February 27, 2011. ↑ "Hack Wilson Is The Old-Style Type Of Bull-Necked Slugger". The Washington Reporter. July 17, 1924. Retrieved February 27, 2011. ↑ "1924 World Series". Baseball Reference. Retrieved February 28, 2011. ↑ Parker 2000, p. 29. ↑ "Homers By Hack Wilson And Kelly Play Important Part In Giants Win Over Robins". The Lewiston Daily Sun. April 20, 1925. p. 9. Retrieved February 27, 2011. ↑ "Irish Meusel In Giants' Outfield". The Norwalk Hour. May 30, 1925. p. 12. Retrieved February 27, 2011. ↑ "Hack Wilson Ties Record With Two Home Runs In One Inning". Reading Eagle. Associated Press. July 2, 1925. p. 18. Retrieved February 27, 2011. ↑ Parker 2000, p. 39. ↑ Parker 2000, pp. 42-3. ↑ Dexter, Charles (June 1956). Will They Beat 56 In '56?. Baseball Digest. Books.Google.com. Retrieved February 28, 2011. ↑ Parker 2000, p. 44. ↑ Parker 2000, p. 47. ↑ "Take Hack For Your Example". The Toledo News-Bee. May 19, 1926. p. 14. Retrieved February 27, 2011. ↑ "Cubs Overcome Braves". Reading Eagle. May 24, 1926. p. 14. Retrieved February 27, 2011. ↑ "Hack Wilson Found In "Beer Parlor" Is Taken to Lock Up". The Telegraph-Herald. INS. May 24, 1926. Retrieved February 27, 2011. 1 2 Parker 2000, p. 53. ↑ "1926 National League Most Valuable Player Award". Baseball Reference. Retrieved February 28, 2011. ↑ "1927 Chicago Cubs". Baseball Reference. Retrieved February 28, 2011. ↑ "1927 National League Fielding Leaders". Baseball Reference. Retrieved February 28, 2011. 1 2 "Cubs And Cards Divide Twin Bill". The Telegraph-Herald and Times-Tribune. Associated Press. June 22, 1928. p. 3. Retrieved February 27, 2011. ↑ "Hack Wilson Was Great Baseball Player But Headache To Managers". The Portsmouth Times. Associated Press. November 24, 1948. p. 11. Retrieved March 2, 2011. 1 2 "Ball Players In Fistic Encounter". Ottawa Citizen. Associated Press. July 5, 1929. p. 3. Retrieved February 27, 2011. ↑ "Hack Wilson Signs To Meet Art Shires". The Toledo News-Bee. December 14, 1929. p. 12. Retrieved February 23, 2011. ↑ Parker 2000, pp. 90–92. ↑ "Baseball Solons Breathe Easier Since Shires' Rout". The Pittsburgh Press. United Press International. December 18, 1929. p. 34. Retrieved February 23, 2011. ↑ Parker 2000, pp. 53–55. ↑ Parker 2000, pp. 53–54. ↑ "1929 World Series Game 4". Baseball Reference. Retrieved March 1, 2011. ↑ Boone, Robert; Grunska, Gerald (January 1979). Hack Wilson: He Was One Of A Kind. Baseball Digest. Books.Google.com. Retrieved February 28, 2011. ↑ "On cue, Drew caps miraculous Sox rally". Ian Browne. MLB.com. October 17, 2008. Archived from the original on October 4, 2009. Retrieved October 2, 2009. ↑ "Comeback among October's best". MLB.com. October 17, 2008. Retrieved October 2, 2009. ↑ "1929 World Series". Baseball Reference. Retrieved February 28, 2011. ↑ "League by League Totals for Batting Average". Baseball Almanac. Retrieved March 1, 2011. ↑ "Hack Wilson Is Picked as Most Useful Player". The Milwaukee Journal. Associated Press. October 8, 1930. p. 2. Retrieved February 23, 2011. ↑ "Wilson's record increases to 191". The Tuscaloosa News. Associated Press. June 23, 1999. p. 5. Retrieved March 1, 2011. ↑ "Single-Season Leaders & Records for Runs Batted In". Baseball Reference. Retrieved February 28, 2011. ↑ Parker 2000, pp. 113–114. ↑ "Single-Season Leaders & Records for Home Runs". Baseball Reference. Retrieved February 28, 2011. ↑ National League year-by-year batting averages. Baseball-Reference.com. Retrieved September 2, 2014. ↑ "National League Changes Ball To Curtail Slugging". St. Petersburg Times. Associated Press. February 4, 1931. p. 2. Retrieved March 1, 2011. ↑ "Hack Wilson Raps Hornsby's Tactics". Saskatoon Star-Phoenix. August 31, 1938. p. 6. Retrieved March 1, 2011. ↑ Parker 2000, p. 134. ↑ "Hack Wilson Benched For Light Hitting". The Telegraph-Herald and Times-Journal. United Press International. May 25, 1931. p. 9. Retrieved March 1, 2011. ↑ "Cubs To Trade Hack Wilson". Pittsburgh Post-Gazette. Associated Press. August 31, 1931. p. 2. Retrieved March 1, 2011. ↑ "Wilson Loses Fielding Job After Brawl". The Telegraph-Herald and Times-Journal. INS. September 9, 1931. p. 9. Retrieved March 1, 2011. ↑ "Hack Wilson Given Gate By Brooklyn Club Solons". Rochester Evening Journal. INS. August 9, 1934. p. 26. Retrieved March 1, 2011. ↑ "Phils Release Hack Wilson". Herald-Journal. Associated Press. September 6, 1934. p. 7. Retrieved March 1, 2011. ↑ Parker 2000, p. 177. ↑ "Hack Wilson Dies; Set Homer Record". The News and Courier. INS. November 24, 1948. p. 10. Retrieved March 2, 2011. ↑ "Hack Wilson Becomes Night Club Impresario". The Evening Independent. Associated Press. August 11, 1939. p. 12. Retrieved March 1, 2011. ↑ "Where's Hack Wilson? Very Much On Deck". Sarasota Herald-Tribune. Associated Press. October 26, 1944. p. 2. Retrieved March 1, 2011. ↑ "Hack Wilson Now Managing City Swim Pool". Schenectady Gazette. Associated Press. July 22, 1948. p. 29. Retrieved March 1, 2011. ↑ "Hack Wilson Is Hospitalized". Pittsburgh Post-Gazette. Associated Press. October 5, 1948. p. 19. Retrieved March 1, 2011. 1 2 Berkow, I (September 5, 1998): On Baseball; Hack Wilson's Lesson Still Valid. New York Times archive. Retrieved September 23, 2013. ↑ "Last Rites Held For Hack Wilson". The Day. Associated Press. November 27, 1948. p. 8. Retrieved March 1, 2011. ↑ Steadman, John (February 1990). The Sad Demise of Home Run King Hack Wilson. Baseball Digest. Books.Google.com. Retrieved March 1, 2011. 1 2 "Services Held For Hack Wilson". The Pittsburgh Press. United Press International. November 28, 1948. p. 28. Retrieved March 1, 2011. ↑ Parker 2000, p. 194. ↑ Photos of Wilson's Art Deco-style grave monument can be viewed here. (A replica of his Hall of Fame plaque was added to the reverse side in 1982.) thedeadballera.com. Retrieved September 23, 2013. ↑ Parker 2000, p. 2. ↑ "Hack Wilson, Giles gain baseball Hall of Fame". The Montreal Gazette. March 8, 1979. p. 21. Retrieved March 2, 2011. "Hack Wilson". MAS Ultra. October 2001. Subscription required. "Chalk up another RBI for Hack Wilson". MAS Ultra. October 1999. Subscription required. Parker, Clifton B. (2000). Fouled Away: The Baseball Tragedy of Hack Wilson (Softcover ed.). Jefferson, North Carolina: McFarland & Company, Inc. ISBN 0-7864-0864-2.